For collector, blogger, and author Jim Linderman, beauty is all about the imperfections, which is why he’s so attracted to folk art. In this wide-ranging interview, Linderman talks about his favorite folk-art pieces he’s collected over the years, explains why he just can’t stand the phrase “outsider art,” and reveals what drew him to vintage photographs of circus freaks and glamour girls. Linderman can be reached via Dull Tool Dim Bulb. My interest in 20th-century American self-taught art came about after I had gone through a million other things—from stamps to bootleg records to books about who killed JFK. I had been at CBS News in New York City for about 8 or 10 years, and I was kind of burned out from working too hard and drinking too much. So I just stopped doing both for a while. It was 1981, and the art scene was exploding. The most entertaining thing to do in New York at the time was to go gallery hopping. Painters were like rock stars, and that was exciting, but in folk art I found an authenticity that didn’t exist in the contemporary art world. It wasn’t long before I realized I could have Howard send me three or four things, and I could sell a couple and keep the one I liked the best. Not that money was a problem; he only charged $10 and $25 for a painting at the time. Collectors Weekly: How did Howard Finster come to be the grandfather of American 20th-century folk art? Linderman: I think a lot of people got into folk art through him, simply because he was so prolific. I believe he made as many works as Picasso. When he passed away, I think his objects numbered in the 50,000s. Because of his work’s availability, he was a gateway artist for people who were searching for something more real than what they were getting out of consumer culture. That’s certainly what attracted me to him. I don’t want to say his work was primitive because that carries derogatory connotations, and he wasn’t an ignorant man, but his work appeared more authentic than the stuff in the galleries. I think it’s a lot like going back and listening to what you’d call roots music today. It just seems more real. I think a lot of people were looking for that, and that’s when they discovered Howard. Collectors Weekly: What were some of the first pieces he sent you? “Youth of Elvis Presley,” circa 1977, by Rev. Howard Finster (1916- 2001). From there, I discovered there was a whole body of work by 20th-century self-taught artists. Their work would come into vogue every generation or so, and then they’d be forgotten. So I started going backwards. During the bicentennial in 1976, almost every state picked its own local living folk artist. They’d dig up somebody who carved decoys or made exceptional quilts, or whatever, and they’d trot them around as living legends, like the last authentic folk artist in that state. So I just hit the road and knocked on the doors of some of these people who’d been profiled in the ’70s to see if they were still producing work. One person led to another, one story led to another. Another influence was a 1982 exhibition and book called “Black Folk Art in America,” which was the first really comprehensive look at African American folk artists in this country. Many of those artists were still living. As I started acquiring their work, I became interested in African American objects such as homemade musical instruments, quilts, and carvings. I was interested in how the aesthetic qualities of African art had been translated into art created by the slaves. Not too many people were really thinking about that at the time. There were some collectors who appreciated the material, but most institutional collections still thought of folk art as coming from the northeastern United States. Outsider art is a misnomer. It’s a marketing term more than anything else. It turns out there were a number of Howard Finsters. None of them knew each other, and they were all motivated by a different intent. Some guy might decide he was going to put 100 weather vanes on his roof just to make it pretty. That artist may have been lumped into the same category as Howard Finster, just because they were both self-taught, unique individuals, with a recognizable, consistent body of work. Every town had their own eccentric. It could be a sign painter, for instance. All the signs today are manufactured, but a homemade sign with a misspelled word? I’m there, just because there’s something special and unique about that. Howard loved what he was doing. At the time he passed away, he was cranking work out like never before. So I don’t think there was ever an issue of him being exploited as some of these artists may have been. For Howard, it was all about getting his message out, and he did it very well. Ultimately, though, I decided that labeling the work as outsider art was inappropriate. Collectors Weekly: Why did you feel it was inappropriate? 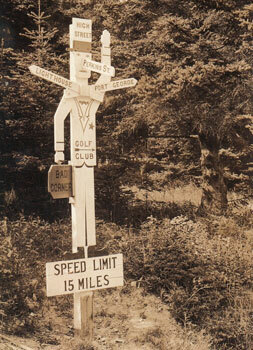 A real photo postcard of a folk art street sign, circa 1920. Linderman: Because the artists didn’t have anything to do with each other and literally do not belong together. There isn’t any “school” or “tradition” really with these artists, so who are we to decide they belong together? The whole point of an outsider artist is that he doesn’t belong in any category, his work is too unique and individual. So how can we put him on the wall next to somebody else and say, “Look at my collection of outsider art”? Howard Finster didn’t know Mose Tolliver, but they’re both in all the books about outsider art. They’re both in everyone’s collection of outsider art, but they had absolutely nothing in common with each other. Outsider art is a misnomer. It’s a marketing term more than anything else. I decided this arbitrary label was inappropriate to use when talking about 20th-century self-taught artists, which to me is a label with less baggage. It doesn’t imply anything other than what it says. Outsider art carries a lot of baggage. It means they were nuts. It means they were strange. It means they were excluded from normal society. It means they were ostracized in some way. Any of those things could’ve been true, but it seems inappropriate to label a group of people with that term, just like in the ’50s when they called anyone who wrote poetry a beatnik. There were a lot of poets in the ’50s, but to place them all under the rubric of beatnik just doesn’t seem right. Collectors Weekly: Who are some of the artists you went on the road to find? Linderman: Boy, everybody who was living at the time. S. L. Jones, Son Ford Thomas, Raymond Coins, Sam Doyle, Mose Tolliver, Reverend Perkins, Sarah Mary Taylor, easily 50 artists. They were all creating work in isolation. It wasn’t a school or a movement or anything like that. What made them so-called outsider artists is that they’d never learned that what they were doing was art. They didn’t even know they were artists. Tramp art came out of the Depression. It was art born of making do. I visited a lot of people who are now household names, but I also met a lot of what I would call undervalued, eccentric artists, although some of them had been discovered by people who had run out of real folk artists to collect. That’s one of the main motivations for collectors, to find what you might call genuine or traditional folk art. They are often looking for things with the same authentic feeling as work from the 18th and 19th centuries. Let’s say they like whirligigs. The ones from 100 or 200 years ago are all in collections, but if a collector comes across a yard full of whirligigs made by somebody in the 1950s, they can still collect that. Collectors Weekly: Did people in the 20th century collect American folk art in a different way than people in the 19th century? Linderman: Well, a lot of this stuff wasn’t even considered art until the 20th century. Folk art as an art form has come about in our lifetimes. You might think it’s ancient, but the first American folk art collection wasn’t put together until the 1930s. 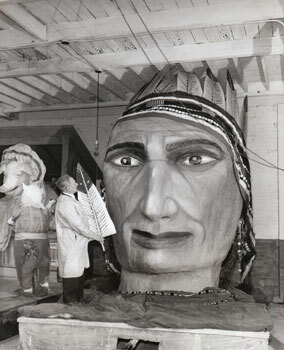 This 1946 photograph of a parade float under construction suggests a folk artist’s hand. There’s this process by which objects become art if someone tells us they’re art. When I was a kid, you could still scuff your feet on the ground and kick up an arrowhead, and I’m not that old. Native American objects, even decorative ones, were frequently treated as artifacts rather than art, but within our lifetimes people have started looking at these things differently. There may have been a bias among earlier tastemakers to deny that indigenous American peoples could even make art because 150 years ago we were literally wiping them out. If the powers that be were to concede that these people were capable of making great art, then it was just that much more inappropriate for us to be shoving them onto reservations. Of course today, most people immediately recognize the beauty in objects produced by this continent’s indigenous peoples. There have always been people who took the time to make something beautiful that didn’t have to be. It’s normal to make a birdhouse, but there’s something about being human that makes some people want to make extraordinarily beautiful birdhouses. When people transform utilitarian objects in this way, they can become art. I suppose there are things being made today with that same quality. I suppose that someday people will recognize that Lady Gaga’s dresses are extraordinary, that rather than being just pop-culture artifacts they’ll be seen as decorative works of art. It’s all an ongoing process of reevaluating the aesthetics of what happened before and determining what’s valuable and what’s not. I’ve heard of kids collecting TV remotes and mounting them on stands. They look striking, but who would’ve thought. I guess in a hundred years, those will be the Hopi pots of this century. Collectors Weekly: What forms or types of folk art are you most drawn to? Linderman: I like things that are bit pathetic, things with a certain emotional quality that more polished objects don’t have. I don’t like Tiffany; it’s too perfect. I don’t like beautiful manufactured objects even if they are in great condition and have a great provenance. I don’t care. But if someone tried to make a beautiful piece of pottery by hand, to me, that’s beautiful and special. 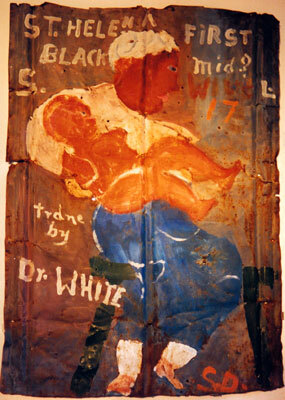 “First Black Midwife,” circa 1980, by Sam Doyle (1906-1995), was painted on scrap tin. Let’s use a cane as an example. There are some extremely accomplished carvers who could make an extraordinary beautiful cane with a dog on it, a dog so perfect you’d think it was a real dog if it was bigger. Well, I’m more interested in the cane from a guy who tried to make a dog but didn’t quite succeed. He lacked the skill to make it perfect, and that imperfection, in turn, makes it more beautiful to me. That’s that sort of quirky pathos that exists in homemade objects that I find so attractive. You find that in vernacular photography, too. It’s not a perfect photograph, it may not even meet basic artistic standards, but it’s beautiful because the photographer clearly tried—it was the best he could do. Similarly, anyone can make a perfect quilt if they practice long enough, have enough help, or follow a pattern. But a make-do quilt that someone actually needed to keep warm, and then spent a little extra time by putting a beautiful flower on it, that’s something. That’s the individuality and the authenticity that I’ve looked for all my life in whatever I’ve collected. 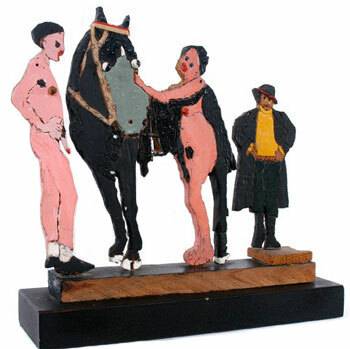 Collectors Weekly: Is every piece of folk art necessarily a one-of-a-kind? Linderman: Yes, to me, clearly. It has to be, at least the real stuff. I don’t think what you see in the folk-art section at Pier 1 is really folk art. They might call it that, but that’s not what I would call it. If it was manufactured it doesn’t fit my definition, even though the finest folk art collections in the world have mass-produced J.W. Fiske weather vanes in them. I don’t know why. Go figure. Collectors Weekly: When did people begin collecting one-of-a-kind, handmade folk art? Linderman: It wasn’t really too long before World War II that the so-called art of the common man—or, I suppose, the proletariat—started being appreciated. The same sort of awareness was happening in other art forms, too. For example, in the ’30s and ’40s, people were going around the country tape-recording folk singers for the first time. I’ve found that one object with a lot of room around it to breathe is more pleasing than 50 things on a wall. I think the Newark Museum had a show of folk art in the late 1930s, and the Museum of Modern Art had one around the same time. Both shows mixed manufactured objects like weather vanes with individually made objects such as trade carvings. I think they showed cigar-store Indians and some ships’ figureheads, which may have been made by trained artists but were then considered folk art. 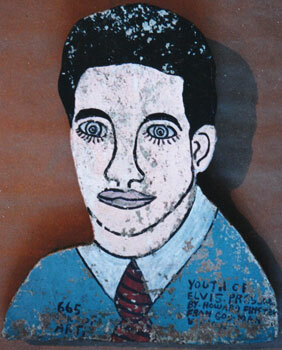 I started collecting folk art in the late ’70s, early ’80s. I began with 20th-century pieces and then went backwards, collecting things from earlier periods. I had a need to acquire art but lacked money. I would have loved to buy an original Andy Warhol or many of the other objects I saw in galleries in Soho at the time, but I couldn’t afford them. That same motivation drove a lot of the early American folk art collectors, at least initially, even though now the work of some of these artists is quite valuable. Today, it’s not unusual for Bill Traylor’s work, which is extraordinary, to sell for $50,000 or $100,000. Originally, he sold his drawings for a quarter. Collectors Weekly: Do you still collect? Linderman: Yes, very much. Everyone should. I have never really had enough money to be a serious collector, so I’ve always had to look for things before anyone else was interested in them, to stay one step ahead of the collector curve. I seem to be good at it, so I’m able to obtain things without spending a lot of money. Then I sell things I own in order to buy something else. It’s sort of a rotating collection. In fact, I have virtually no folk art left because it’s all dribbled away, traded and sold for other things. 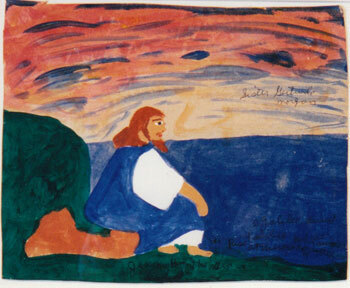 “Jesus by the Sea,” 1975, by Sister Gertrude Morgan (1900-1980). If I could collect anything I wanted, I would collect Navajo blankets, pre-reservation Native American painted objects, and Shaker furniture. To me, those are the epitome of beauty and the most sublime objects that have ever been produced in the contiguous 48 states. I’ve been fortunate enough to own some of those things and study them for a while. They have a sort of honest authenticity that few decorative objects have. These days I’m collecting photographs, but in a very narrow field. I’m currently collecting the work of a photographer named Frank Wendt. He took pictures of circus and sideshow performers in the late 1890s, but he also took really beautiful photographs of young circus and stage performers. No one’s written about him. I think I’m up to about 300 photos. Lots of people have collected photographs of circus freaks, but very few have pegged their collections to a specific photographer. Eventually I’ll turn the collection into a book or an exhibition. I always collect with some purpose in mind. Collectors Weekly: How do you decide what to collect? Linderman: I don’t know. Maybe it’s like songwriting. It just comes; one thing leads to another. For me, it’s pretty much all about learning, and the reason I collect is to learn about things that interest me. And since I’ve never stopped learning, I guess I’ve never stopped finding a category to collect in. I suppose that someday people will see Lady Gaga’s dresses as decorative works of art rather than just pop-culture artifacts. I also collect for my blogs. I have a handful of blogs that I try to post something on every day. Basically, I consider them my art form. I’m currently profiling dirty cartoonists from the ’50s and ’60s who fell out of favor when the women’s movement came along because they drew mostly dumb-blonde gags. They became politically incorrect. As a result, there’s a huge body of work of quite talented illustrators and cartoonists who were ignored because their work was no longer in vogue. That sort of material is for my blog called Vintage Sleaze. For my Dull Tool Dim Bulb blog, I collect unusual photography. It could be anything that’s been overlooked. Everything shown on my blogs is something I own, something I picked up and used to tell a story. So every day I learn something new. At a certain point in my life, I just decided I was going to leave a big digital footprint. And it seems to be working because I’ve had half a million hits on my blogs, which to me is just mind-boggling. Collectors Weekly: Do you live with your collection? Linderman: I always have something on display, but I don’t have too many large physical objects anymore since I moved. One reason I love photographs is that they’re easy to store. At any given time, I have maybe 10 or 15 things in front of me that I like to look at. Currently they’re hand-drawn cartoons, tintype photographs, and a few salesman sample-type objects. 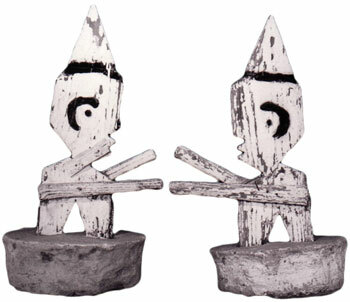 A pair of untitled wood figures, circa 1975, by Herman Bridgers (1912-1990). In general I don’t display things like I used to. There are two kinds of collectors: those that fill space and those that leave space in between. As I’ve aged, I’ve found that one object with a lot of room around it to breathe is more pleasing than 50 things on a wall. A lot of contemporary artists end up being minimalists, and it might be through sheer exhaustion from being exposed to so many things. That’s what I’ve become. I’d rather see two or three little things in front of me than a display. In fact, I get really tired at museums because there are so many things in front of you. It’s also very important, I think, to display an object properly, and that means taking it off its crowded shelf and placing it by itself against a white background, so you can see what it really is. A rotten, old birdhouse sitting up in a tree doesn’t look like much, and neither does a whole wall of birdhouses. But if you take one sublime imperfect example and put it in the middle of an empty room, man, it can really stand out. If you call it art and display it as art, it’s art. Collectors Weekly: What have been some of your favorite pieces you’ve collected? Linderman: The most profound objects—not necessarily the most beautiful—I’ve owned are pieces of pottery made by a South Carolina slave named Dave. He made enormous utilitarian jugs. They’re big, brown, ugly things, meant to store pickles and meat and things like that. At the time he made these pieces, African Americans weren’t supposed to be able to read and write, but Dave inscribed a poem on some of his jugs. It’s amazing to think that a slave would take the time to embellish his objects with very heartfelt poetry. He worked in the Edgefield district of South Carolina, and his owner paid less for Dave than his pottery sells for today. Every good antique should tell a story like that. 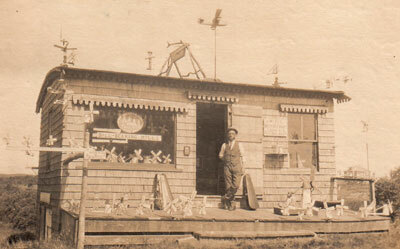 A real photo postcard, circa 1910, of the Shavings Shop in Chatham, Massachusetts, by Charles H. Smallhoff. I owned a William Edmonson bird for a while—he was an African American sculptor. I owned a giant concrete sculpture that Howard Finster made of Elvis, which was number 600-something. That was one of my favorite pieces. 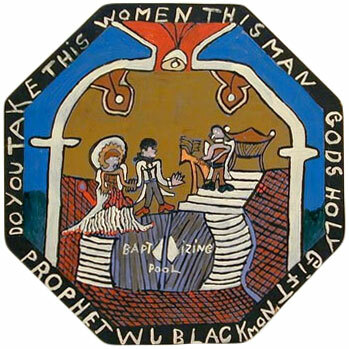 I owned a dozen of the earliest works Sister Gertrude Morgan made. They were flashcards that she used in Bible lectures—she painted on them with shoe polish. There would be a Bible picture painted on the front, with the verse from the Bible that went with the illustration on the back. I miss those. I also miss my Dave jugs. When I was younger, I heard about an artist named Chuckie Williams. I think he’s known to the world now as Artist Chuckie. He was an African American fellow who lived in Shreveport or Lafayette, Louisiana. I saw a picture of his work after there had been a fire in his house. He had to take his paintings out of his house to save them—there must have been 1,000 of them on his front lawn. The minute I heard about this guy, I rented a car and drove from New York to Louisiana, bought 10 paintings, and drove home. I don’t do that sort of thing anymore. Right now, my favorite sculptural object is a piece of shrapnel. My father, who passed away six months ago, was wounded in World War II. He was hit with shrapnel after landing not long after D-Day. That piece of shrapnel saved his life because his platoon was wiped out a month later at the Battle of the Bulge. Collectors Weekly: You wrote a book that was nominated for a Grammy. What was it about? Linderman: For “Take Me To The Water,” I collected about 150 antique photographs of people being baptized, immersion baptism. All of them were pre-1950. I just plugged in the keyword on eBay and bought everything I could for 10 years. It was not too competitive at the time because everybody who had learned how to use their computer was putting things up on eBay to see what would happen. An untitled self portrait, circa 1987, by Jimmy Sudduth (1910-2007). The photos were compiled into a book by Dust-to-Digital, which is an Atlanta-based label that reissues old blues records. They packaged it as a hundred-page book with a CD of old-time ‘Wade in the Water’ songs. It got nominated for a Grammy in the Best Historical Reissue category. We didn’t win, but I have a medal. It’s quite an honor to have made a contribution like that. I publish my own books just for fun. No one buys them, so I think of them as limited-edition prints, like an artist would. I just wrote and published a book called “Camera Club Girls.” In Manhattan in the 1950s, there used to be these amateur camera clubs where women would pose naked. That’s where Bettie Page came from. I found more than 100 original photographs taken by one man, Rudolph Rossi, who attended those camera-club meetings. He hand-painted each photo. They’re quite striking, so I published them as a book because I thought they should be shared. I also published a book called “The Painted Backdrop.” It was the first book to discuss the scenery behind people posing in 19th-century photographs. Turns out there used to be itinerant portrait painters who would go from house to house offering to paint family portraits. Most early American folk portraiture came from those wandering painters. When the camera came along, everybody assumed those painters would be out of work, but the painters didn’t go away. They just started painting the backdrops that were used behind people in the photographs. For “The Painted Backdrop,” I collected 200 tintype portrait photographs from about 1860 to 1890. I chose them not for the quality of the portraits but because they had interesting backdrops behind them. I’ve done three or four of those kinds of projects where I’ll assemble a collection, which consists of some hundred objects, and publish it as a book. With the baptism project, I gave the photographs used in the book to a museum, where they’ll be exhibited next year. I like the idea of keeping these collectibles together. Collectors Weekly: How is the digital age affecting collecting? Linderman: I’m sitting here watching all these physical forms disappear—books, newspapers, vinyl records. The Internet has largely replaced the things I loved as a collector and have used in my work. That’s fine with me because my legs hurt and I don’t really want to go out, but it’s also kind of sad. Fewer and fewer physical objects are being produced anymore. No one’s going to spend an afternoon on iTunes looking for a rare record. That’s really unfortunate because the hunt was so valuable. If what you want is just a mouse click away, and if there’s no artifact to go with it, it’s not quite the same thing. An untitled sculpture, circa 1975, by Stephen Ashby (1904-1980). If that makes me sound like an old man, well, too bad, but it’s true. Physical objects are really beautiful. Photographs are really beautiful. One of the reasons they’re beautiful is because they age; they crumble and decay and develop a surface that’s worn and used. A digital photo will never do that. It’s just there. It’s not a physical object. I think that bodes poorly for the collectibles market, to tell you the truth. Tramp art came out of the Depression. It was an art born of making do. They had cigar boxes, so they made do and created things out of them. That’s tramp art. We’re sort of in another Depression right now, so I expect there will be lots more making do, unfortunately. One positive thing the Internet has shown us is that there’s a tribe for everything. We’re all sort of like crows putting shiny objects in our nests. There’s some human or genetic need for us to assemble things into groups. In order to understand things, we label objects or group them so we can say which is good and bad, I guess. Collectors Weekly: So, for you, folk art has a humbling effect? Linderman: Clearly, because I don’t make anything of my own. It’s been a pleasure and a joy to own virtually every object I’ve ever acquired for any number of reasons. I’m lucky to be able to appreciate objects for what they mean, what they stand for, and what they represent, both physically and intellectually. And if there’s an authentic story behind it, it adds that much more. It’s not just a carved cane sitting in a stand. I’ve always enjoyed the experience of looking for pieces, which is why I think the process of finding something is just as important as owning it. As soon as most collectors obtain something, they’re immediately off to find another one. If you’re really obsessed about what you’re collecting, you hardly even look at what comes into the house because once it arrives it’s time to go find something else. The good news is that there will always be artists, which means there will always be folk artists, however you define it. A great deal of what we do is born out of need—either to make something functional or, for a smaller percentage of people, to make simply something, period. Somewhere out there, someone is making a cane, and they’re making it beautiful. I really enjoyed reading this interview. Jim has posted such interesting Show and Tell items here on CW, and those had already led me to check out his blogs and books. I think I will have a greater appreciation for his writings now, as he spoke so honestly here about why he collects, what draws him to these unusual treasures. His collecting journey is a wonderful story in itself, illustrated with these quirky and unique items. The idea of leaving a wide and large digital footprint really resonates with me, too. I think it is a way that these items, and their stories, will live on and be available for future generations to enjoy, long after the actual artifacts have crumbled away. Gone, but not forgotten, thanks to Jim’s documentation. I loved this by Jim and his world of folk art. I too have chased it for the last 30 years and recognize many of the artists he is talking about. It has been a wonderful world. There are so few of us old timers left. Thank you so much for this article! olRoff, age 74. This was one of the most interesting and captivating articles on folkart that I have ever read….Thank you Jim Linderman and collectors weekly. The information has instilled in me a deeper appreciation for my family’s own folk art….African American M-provisational Quilts. I have always appreciated the artworks….but seeing them thru Jim Linderman’s eyes has widened that appreciation tremendously. I also collect other peoples folk art as something that I enjoy doing naturally and have done since I was quite younger…but Jim has helped me to appreciate my own collections with increased understanding as to why the art is important and how to display and enjoy it to the fullest degree. Once again “THANKS”….for being so informative and helpful to us viewers of collectorsweekly. LOVED this interview w/ jim linderman. i often read his blogs and along w/ this interview, they are always though-provoking. i don’t always agree w/ everything he says, but that doesn’t matter, because he is responsible for making me think deeper about these wonderful objects. each one has a story to tell, or the best objects have many stories to tell – one for each person who has really appreciated it! I saw where you said you were currently collecting Frank Wendt photos but did not see any or info about them. My great uncles Jack and herbert Barnett were in many of these photos and I wandered if you had any I might obtain copies or at least see them and if you had some .They were midgets. “ ” There’s no way to take a tattoo home, except in your skin.